There was comedy, a game show, magic tricks, and chocolate-covered crickets. Just your typical climate change summit, right? 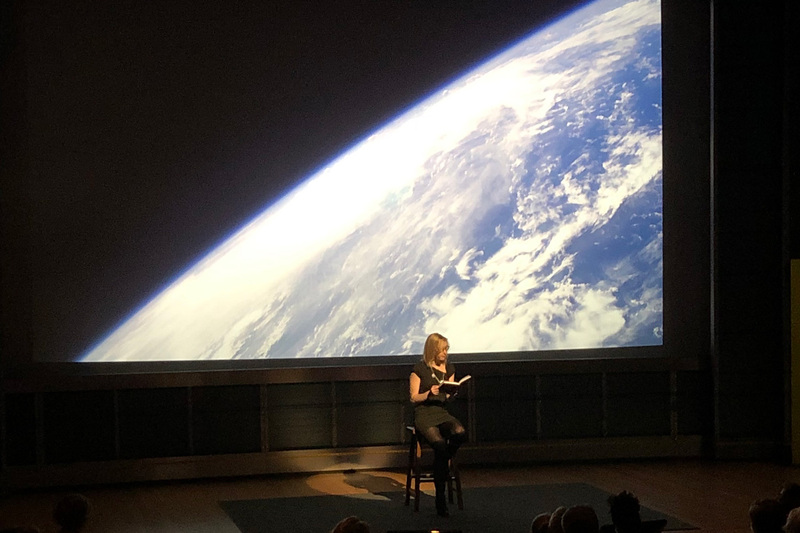 Nearly 400 people filled Grosvenor Auditorium at National Geographic in Washington, DC for BE.Hive: Climate Change Needs Behavior Change, a day-long summit exploring solutions to climate change through the lens of human behavior. Over 100 more joined via livestream throughout the day. 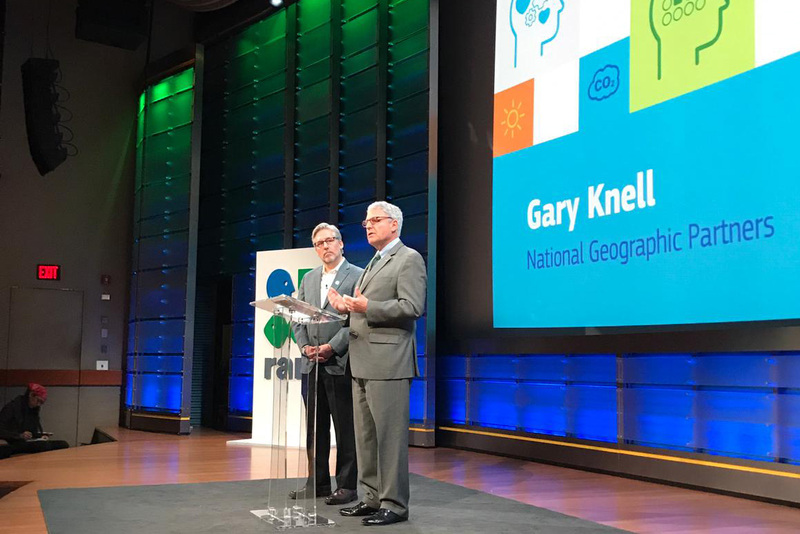 Rare president and CEO Brett Jenks (left) and National Geographic’s Gary Knell (right) welcome attendees. 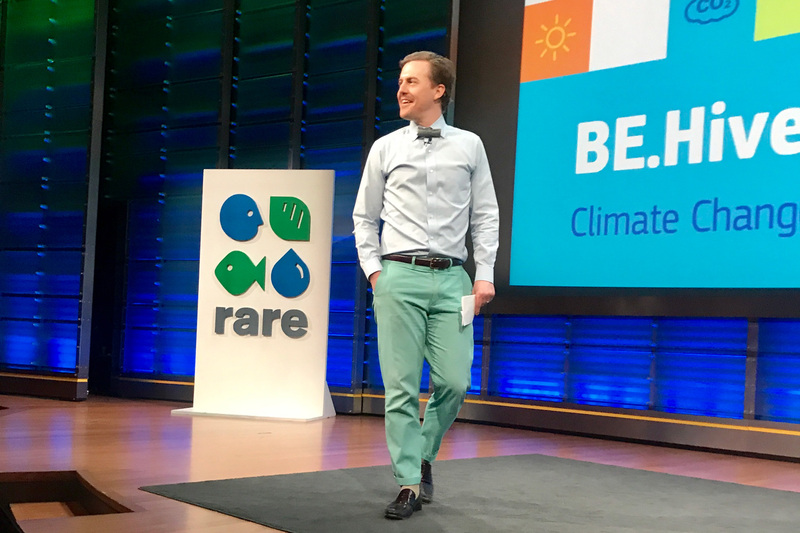 The summit, hosted by Rare’s Center for Behavior & the Environment (BE.Center), brought together climate experts, behavioral scientists, business leaders, entrepreneurs, and entertainers – all offering a unique contribution to the climate conversation. “It’s really hopeful and motivating. Climate change is touching every single one of us so it can’t just be scientists solving this problem. We have to bring in people who know how people work,” said Dr. Kate Marvel, a climate scientist with Columbia University and NASA’s Goddard Institute for Space Studies. The day was far from a normal convention. Marvel led the day with a “climate meditation.” A panel of behavioral science luminaries competed in a game show-style session highlighting our behavioral tendencies. Filipino artist and climate advocate AG Saño led an “art attack,” where he and summit attendees co-created a mural. Magician and comedian Kyle Eschen pulled audience members on stage to demonstrate our cognitive blind spots. And tying it all together was emcee and Saturday Night Live cast member, Alex Moffat, who kept the audience lighthearted and laughing throughout the day. Kate Marvel led off the day with a climate meditation. Saturday Night Live cast member Alex Moffat served as the BE.Hive emcee. BE.Hive was a meeting of the minds that are blazing trails in their respective fields. 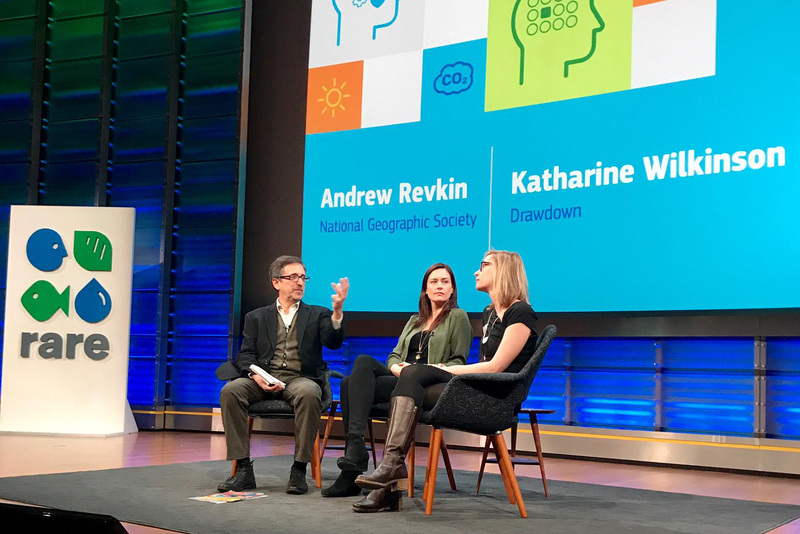 A conversation between Marvel, Dr. Katharine Wilkinson of Project Drawdown, and National Geographic’s Andy Revkin evoked the power of identifying climate solutions. “I’m hoping to create solutionaries,” said Wilkinson. National Geographic’s Andrew Revkin, Project Drawdown’s Katharine Wilkinson, and NASA’s Kate Marvel have a climate conversation. Wilkinson was followed by an all-star line-up of behavioral scientists. 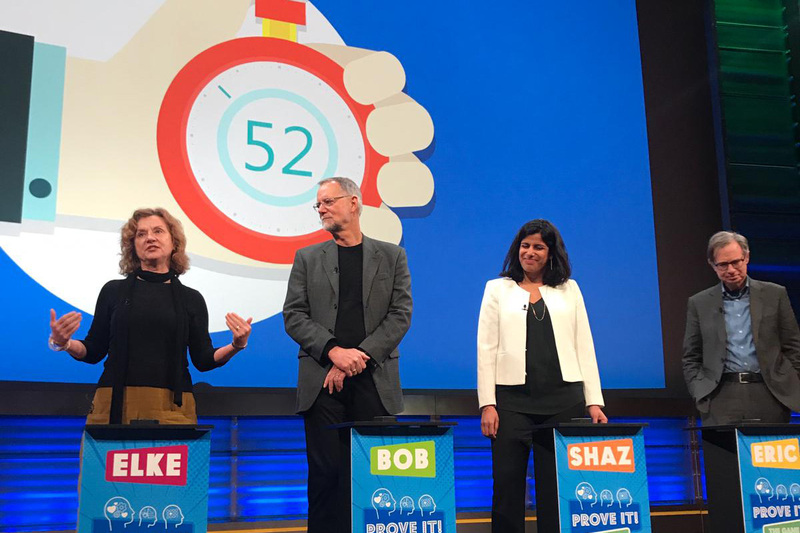 Cornell’s Bob Frank, Princeton’s Elke Weber, Columbia’s Eric Johnson, and Indiana’s Shahzeen Attari ignited the crowd with illuminating talks about human behavior, before participating in “Prove It!” – a mock game show designed to introduce behavioral insights and biases. Princeton’s Elke Weber, Cornell’s Bob Frank, Indiana’s Shahzeen Attari, and Columbia’s Eric Johnson playing “Prove It!”. Using animals as an example, University of Michigan professor and National Geographic fellow, Julia Lee, spoke about the power of shifting narratives to reframe public perception and motivate action. 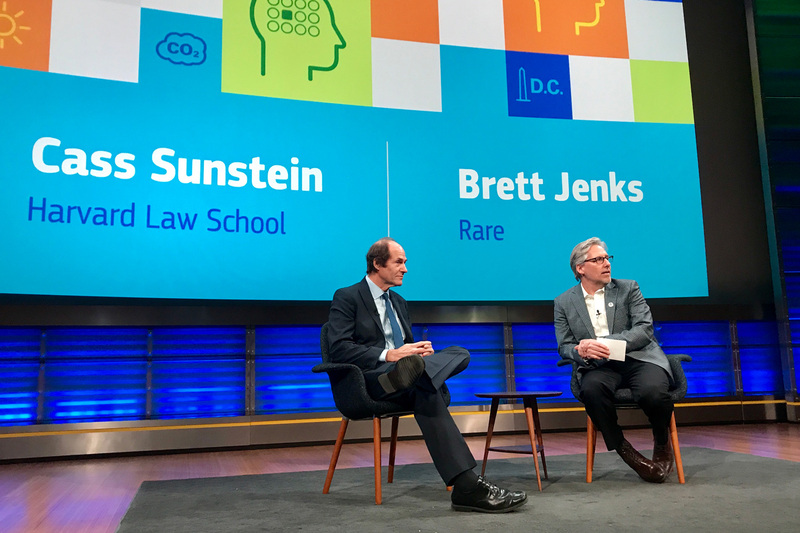 The morning session concluded with Brett Jenks interviewing Harvard professor and Nudge author, Cass Sunstein, about the power of “nudging” and how redesigning the presentation of choices could encourage sustainable choices like purchasing energy-efficient appliances. Cass Sunstein and Brett Jenks in conversation. BE.Hive also showcased how the push for sustainable solutions is ripe for entrepreneurs. Alex Laskey, co-founder of Opower, shared his experience in growing a successful company geared toward helping utilities deliver better and more energy efficient experiences to customers. 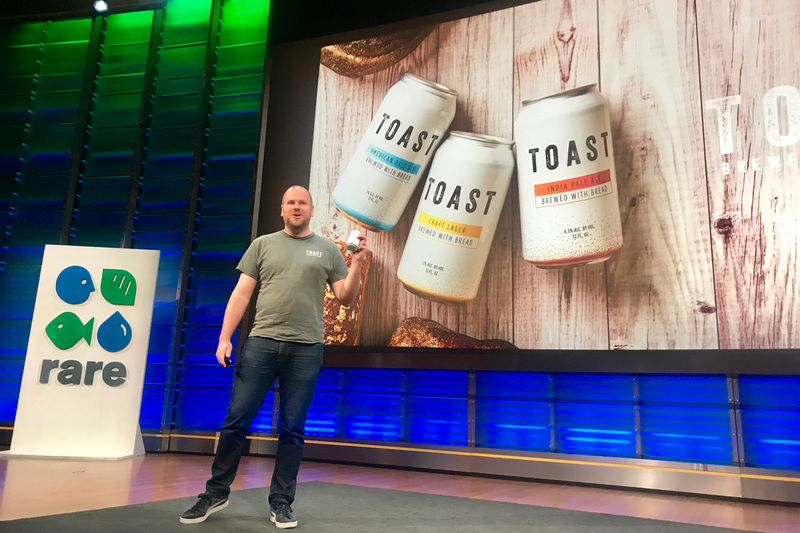 Social entrepreneur Robert Wilson made everyone thirsty for solutions by sharing beer tastings and wisdom about how his company, Toast Ale, uses unused bread to brew beer and reduce food waste. Attendees also got a peek behind the corporate curtain to learn how companies are using behavioral science. Chris Graves from Ogilvy’s Center for Behavioral Science pointed out how important it is to make problems concrete, and showed relevant examples of behavioral approaches used in advertising, such as appealing to customers’ emotions or putting a human face on an abstract concept. And Charlotte Blank, Chief Behavioral Officer at Maritz, spoke about the behavioral science behind business strategies like loyalty programs to earn customer retention. The day culminated with announcements of the winners of Solution Search, a global contest sponsored by Rare, Conservation International, National Geographic, The Nature Conservancy, the UN Development Programme, and World Wildlife Fund to identify, spotlight and reward promising and proven approaches to helping people reduce their greenhouse gas emissions. 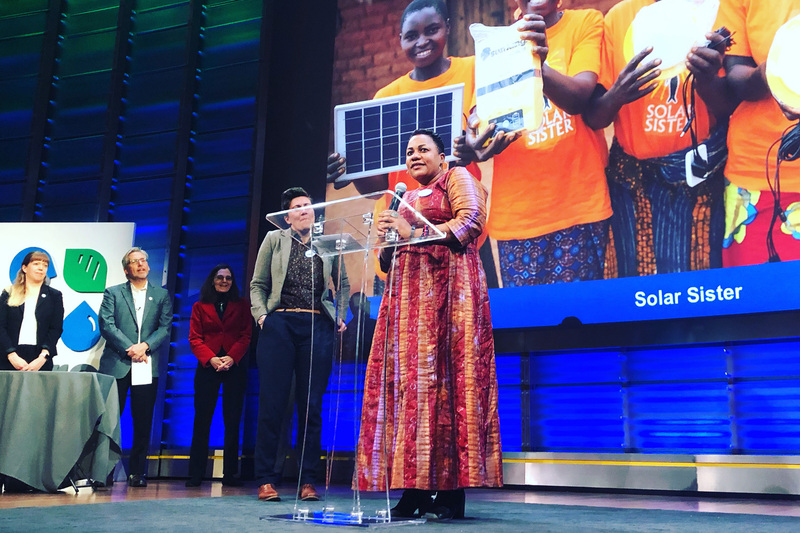 Solar Sister, an initiative to empower sub-Saharan women as renewable energy entrepreneurs, won the Judges’ Choice award. 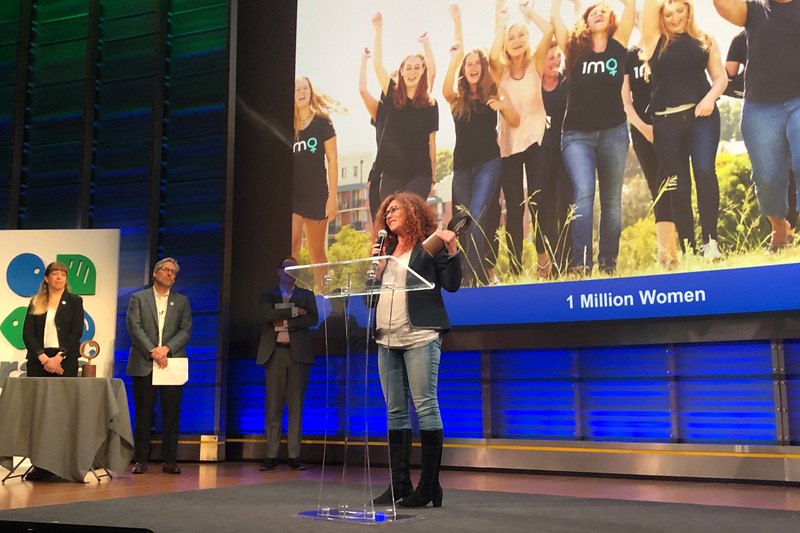 1 Million Women, an Australian-based organization creating a women-led movement to reduce energy usage, won the People’s Choice award. Both winners will receive the $25,000 grand prize. Solar Sister’s Fatima Muzo accepts the Solution Search Judge’s Choice Award. Natalie Isaacs of 1 Million Women accepts the Solution Search People’s Choice Award. “What have we learned today? We learned that while the challenges are great, solutions are everywhere,” said Lynn Scarlett, Vice President of Policy and Government Affairs for the Nature Conservancy. Solution Search wasn’t the only contest that crowned its winner. Rare partnered with Inova, a northern Virginia-based system of hospitals and other healthcare service providers, to run a “Design Challenge” competition. Competing teams were charged with designing a behavioral solution to help employees shift their commuting behavior and reduce their greenhouse gas emissions. A Yale School of Forestry and Environmental Studies’ alumni team won based on audience vote. “Seven behaviors. Ten percent of Americans. The change is already happening, everywhere we look. Today, we’re keeping that movement going,” said Jenks. 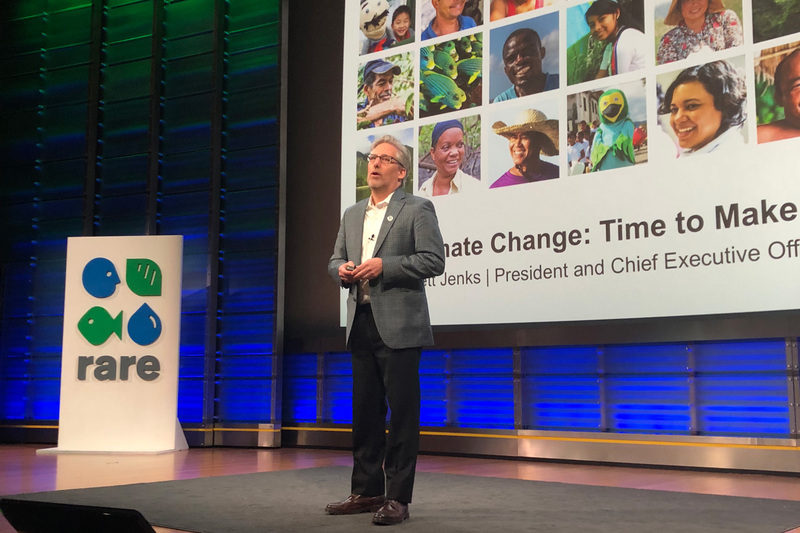 Brett Jenks’ message on climate change: Time to make it personal.